Constructed from Medium Density Overlay – MDO is a paintable surface made of plywood with a weather-resistant resin overlay bonded to the wood by heat and pressure. Paint finishes on MDO are up to three times more durable than the same finish applied to ordinary plywood. After it is hand built it is then primed and painted with an exterior paint that will handle the elements. Our lighthouses come standard with an electric plug in light, however, you may upgrade to a Solar Light, Flashing Light, Rotating Light or Strobe Light. Use the drop down menu to make your selection. Do you need to cover a Well Head or Sewer Pipe? Our Amish Made Wooden Lighthouse is an attractive solution to covering these unsightly obstructions in your yard. Our Wooden Lighthouses are handcrafted so that they are hollow on the inside. They can then be set over many kinds of objects. The dimensions are listed in the Quick Specs area. 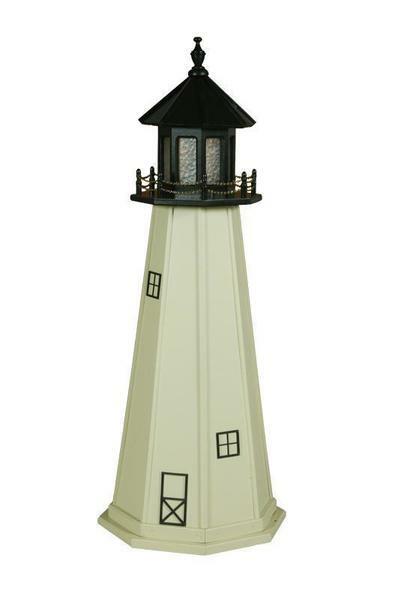 Check out the DutchCrafters Blog for for more ideas on how to use your new custom crafted lawn lighthouse. Please call 1-866-272-6774 if you need assistance or stop by our Amish furniture store in Sarasota, Florida. As always our lighthouses are carefully packed for shipping safety. Please allow 1-3 weeks for your lighthouse to arrive. This stubby, 54 foot lighthouse is located near Silver Bay, Minnesota, overlooking Lake Superior. Completed in 1910, this light was built in response to the loss of ships during the famous Mataafa Storm of 1905 in which 29 ships were lost on Lake Superior. Sitting atop a 130 foot cliff, the hexagonal stone tower has prevented many a shipwreck since. The intense light, shaped by the bi-valve type Fresnel lens flashed a half second flash every nine and a half seconds and was visible for a distance of 22 miles.